Shas spiritual leader Rabbi Ovadia Yosef says Gilad Shalit's release hints at the joy of the resurrection of the dead. 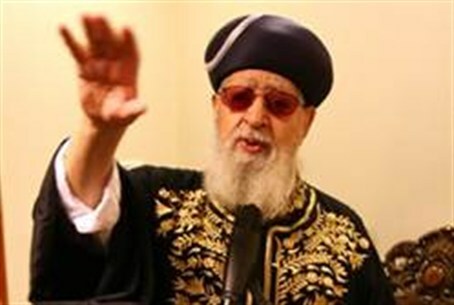 Rabbi Ovadia Yosef said Wednesday that this year’s Hohsana Rabba is infused with the special joy of redemption and gives hints at the joy of the resurrection of the dead due to the return of IDF soldier Gilad Shalit, who was kidnapped by Hamas and held captive for 1,941 days. "What great joy there is in Israel with the release of Gilad Shalit. Five years away from home… when will we will see the resurrection [of the dead] we will have a similar joy, when our loved ones rise after 20 or 50 years of not seeing them," Rabbi Yosef said during a lecture in Jerusalem. The resurrection of the dead – included as one of Maimonides canonical 13 principles of Jewish faith – is derived from the prophet Ezekiel’s vision of dry bones coming to life. Its meaning is multi-layered in Jewish tradition, with rabbinic commentaries discussing wide ranging terms. In addition to its common literal interpretation, the ressurection of the dead has also been used as a descriptive metaphor for the return of prophetic awareness, the spiritual rejuvenation of the penitent, to the experience of the lost Jew returning to the fold, to the rebirth of the Jewish nation in its ancestral homeland prior to the messianic age, among others. Shas ministers were ordered by Rabbi Yosef to support the government deal to release Gilad Shalit. He also asked Shas’ political leader, Interior Minister Eli Yishai, to strive to persuade ministers from other parties to support the deal as well.